Amy Cella (SFSU) Inspired by the frontier mentality of the formative Pacific Northwest where communities felt they could pick and choose the best of the past without the hindrance of the weight of history, Cella’s work meditates on the ascendancy of the so-called “post-medium age” in contemporary art practice. Yangyi Chen (SFAI) Chen pushes tactility and three-dimensionality into her photographic work, creating illusions with unexpected materials that redefine our sense of familiarity with the medium. Joseph Ferriso (Stanford) Ferriso presents Spiral Doorway, an open ended sculpture with no fixed orientation or scale. Bearing no loyalty to the wall, floor or ceiling, this work represents freedom from restraint. As it’s reworked with every presentation, Ferriso also breaks conventional rules of exhibition and archive. 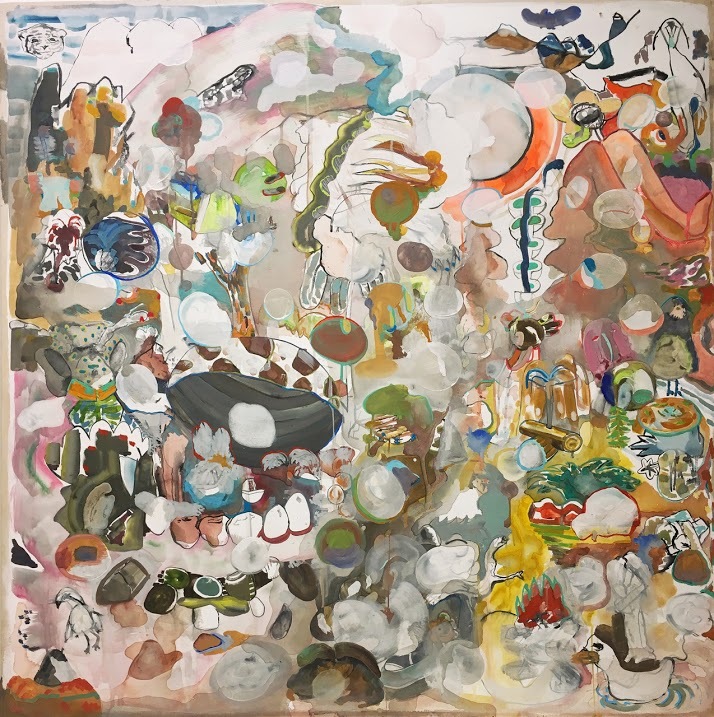 Sean Howe (Stanford) Howe makes paintings that fall somewhere between the classifications of figuration and abstraction. Using cues from geological and ecological sciences, and automatic drawing to push form, color, and texture, Howe creates abundant worlds with vast networks of referents that defy categorization. Sean Howe. Swirly Gates, 2017. Gouache and gesso on plywood. Charmaine Koh (CCA) Hybridity is key to Koh’s work, which draws upon diverse influences, from anime, to family photographs, to computer color gradients. As an artist living in between borrowed origins, cultures, and countries, Koh playfully mixes seemingly disparate elements on the canvas so that they neatly co-exist. Ans Li (SFAI) Li’s work explores the relationship between digital and analogue techniques, highlighting the failings of both while refusing to belong to either. Without ever using a camera, Li digitally designed her pieces, then printed them out on Polaroid film with a “digital-to-analogue” tool, then scanned them back to a digital form. The colors and geometry may appear retro, but Li’s process is oriented to technologies of the future. Emily Meisler (SFAI) Exploring the natural and organic through sculptural forms, Meisler juxtaposes her subject matter with industrial materials like cement and wire that further abstract the original inspiration. This disparity highlights environmental concerns, though the sculptures themselves ironically appear extra-terrestrial, existing in a mysterious space between the naturally occuring and the manmade. Leslie Samson-Tabakin (SFSU) Samson-Tabakin presents Enough Is Not Enough, a sprawling, text-based installation that acts as a mind map, encompassing both stream of consciousness and collected statements. Based on the concept of tautology (the idea of saying the same thing twice in different wording), this time- and site-specific work suggests that perhaps in our tireless search for clarity, new direction and originality, we are simply repeating ourselves. Opening Reception: Friday, March 23, 2018. 6-9pm. Hours: 1-6pm every Thursday-Saturday from March 24 - April 28, 2018.